A chronic problem that bothers women more than any other, because it also affects self-esteem, is trouble related to the skin. Skin eruptions can happen at any age, affecting one very early in life and also around menopause. The triggers may not be just hormonal—allergic reactions to food, atmospheric triggers, chronic inflammatory conditions, weak and lethargic digestion and topsy-turvy metabolism can cause a cluster of problems. Though some women may have a particular strain of problem—like eczema or dermatitis—others may have a cluster of problems that appear unrelated but are often piled up into the ‘sensitive skin’ category. As much as external treatments are essential, a lot of skin problems are acknowledged to have psychosomatic triggers. In yoga treatment, therefore, poses for the treatment of skin issues as a rule are all similar; they include poses to flush the face with more blood supply (such as forward bends, inversions); poses that calm the mind (again forward bends, grounding standing poses); and meditative poses that curb the spiral of mental strain that leads to anger, anxiety or hurt. Finally, and not least of all, they include poses that are healing to the digestive tract because your skin is deeply affected not just by what you eat but how you absorb it (these include twists and forward bends). To have a really responsive programme, you must practise daily. Include calming pranayamas like alternate nostril breathing (anulom vilom). Try not to rush through your practice because it will have a negative impact. Do less on days when you feel rushed but choose strong poses. And always conclude with a short meditation. In fact, meditation must be made an integral part of healing when chronic skin conditions trouble you. You need to simultaneously overhaul your lifestyle habits; you could involve a dietician to speed up the progress. Some basic yogic lifestyle habits include having regular timings for sleeping, waking up and meals; avoiding eating on the run; chewing your food thoroughly and ensuring adequate sleep. Most important, ensure you have some ‘me time’ and introduce regular physical activity in your life. These will have a positive impact on your blood circulation; robust blood circulation goes far in healing skin conditions. forehead to the thigh. Continue normal breathing, holding the pose for 10 seconds. Release and repeat on the other side. 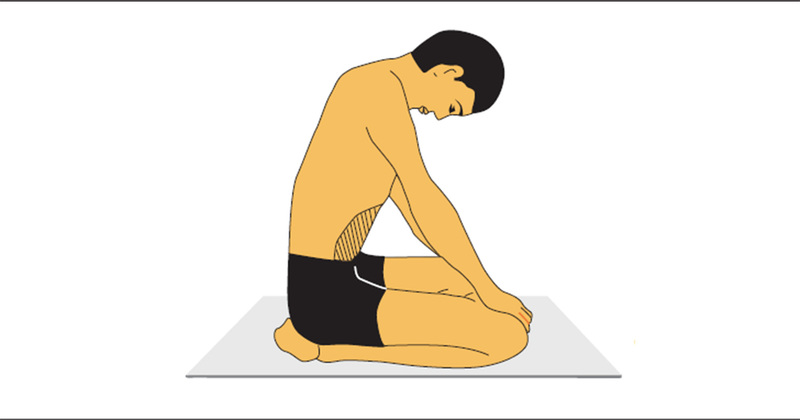 Initially, many aspects of this pose may be difficult for a beginner: the bent knee may not reach the ground (use a cushion or foam block till hip flexibility allows it); the hand may not reach around the foot, so hold the leg where your hands reach; and the forehead may not reach the thigh, but just keep the neck relaxed. No matter what stage you are in, though, this pose has a bouquet of benefits. Benefits: It puts pressure on the abdomen, positively affecting digestion and metabolism. It causes a rush of blood to the face and head, which calms the brain and busts stress. It also burns belly fat. This is regarded as a must-do in any daily yoga practice. It has to be done on an empty stomach, so ideally do it in the mornings or with a sufficient gap between means. Don’t do this if you suffer from extreme inflammatory conditions, such as ulcers, eruptions, fever, etc. This kriya may be done seated or standing. Lean slightly forward and cave your shoulders towards each other, creating a deep curve at the belly. Inhale deeply. Then, exhale forcefully, pushing all air out of the lungs. Tighten the belly and pump it continuously for 10 to 30 counts. To do this, you must draw the stomach in and out firmly and rapidly. This is one round. You may breathe, though one tends naturally to hold the breath while tightening the stomach. Do one round for a few weeks after which you can increase the number of pumpings. This is an ideal preparatory practice for pranayama/breathing exercises. Used in therapy for most chronic conditions, it is also said to keep you young.